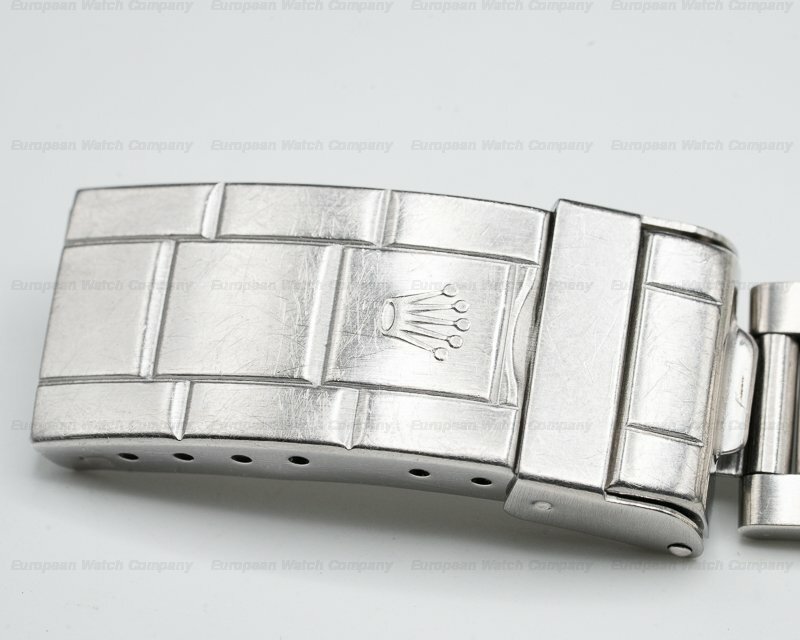 30634 Rolex 1665 Sea Dweller, stainless steel case is in excellent condition, on a stainless steel Rolex Oyster bracelet (93150) with 585 end links, automatic Rolex caliber 1570 movement, date at 3 o'clock, centered sweep seconds hand, COSC, bi-directional rotating bezel, screw down crown & caseback, original MK 4 dial is in fantastic condition with original tritium lume on dial and hands, creamy matching patina on hands and dial, 804XXXX Serial (1983), water resistant to 610 meters/2000 feet, diameter: 40mm, thickness: 17mm. 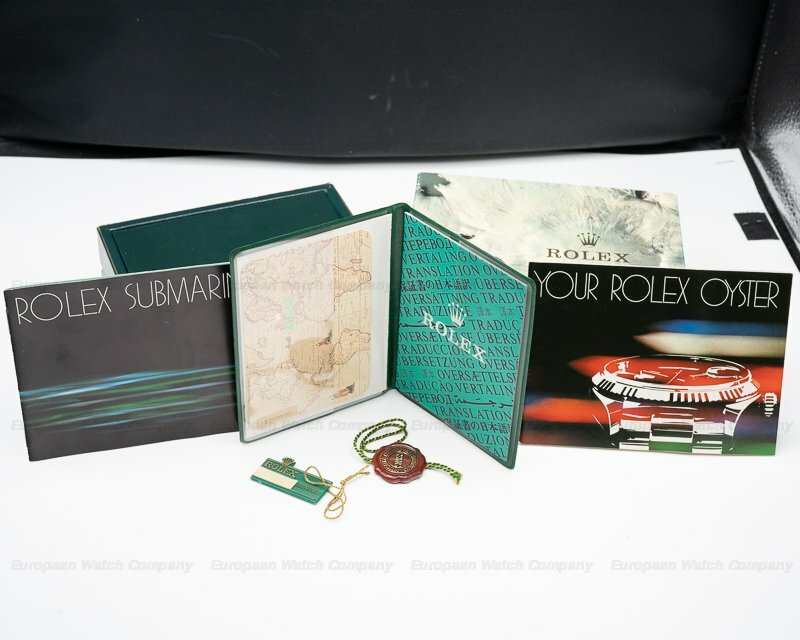 Purchased from the original owner, the watch is in excellent collector condition with outstanding full set including original box (with price tag for $634), instruction booklets, leather folder, hang tags, and original punched papers. 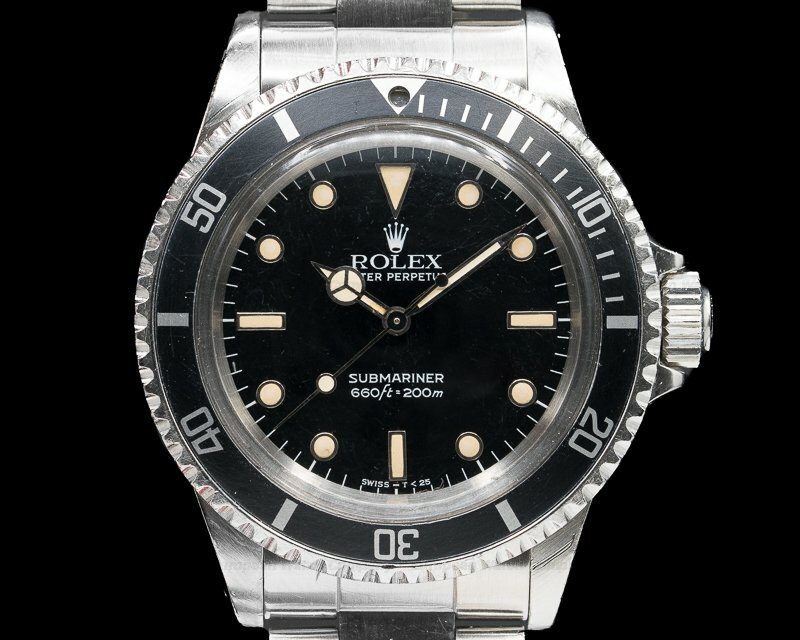 This watch is in stock and available for purchase at our retail showroom in Boston. 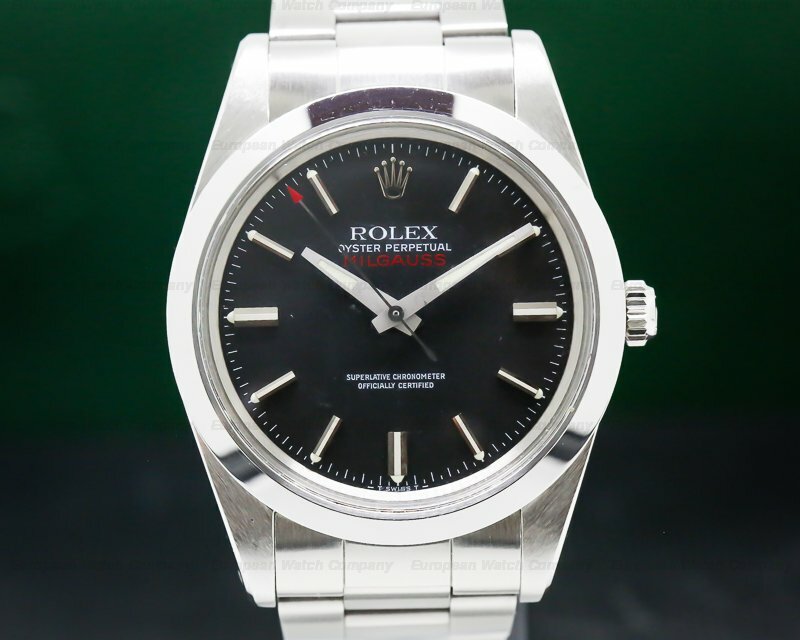 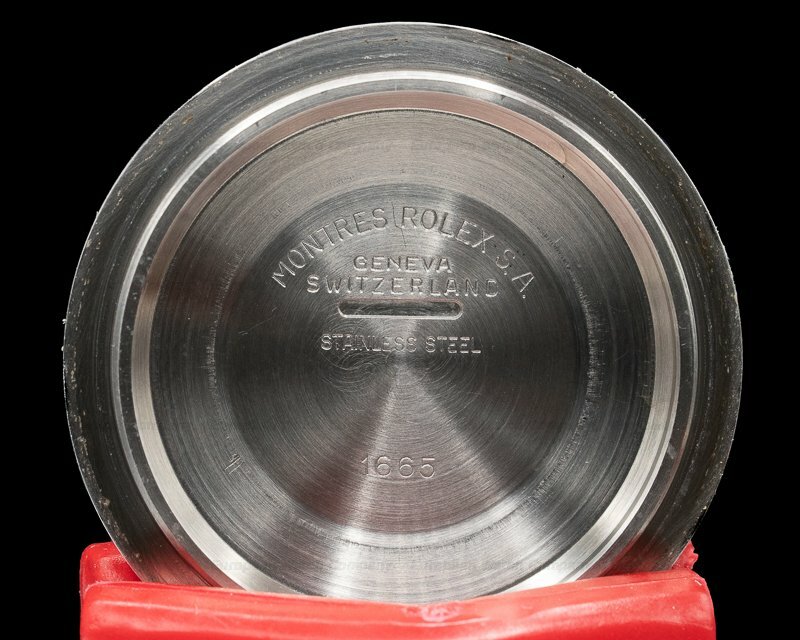 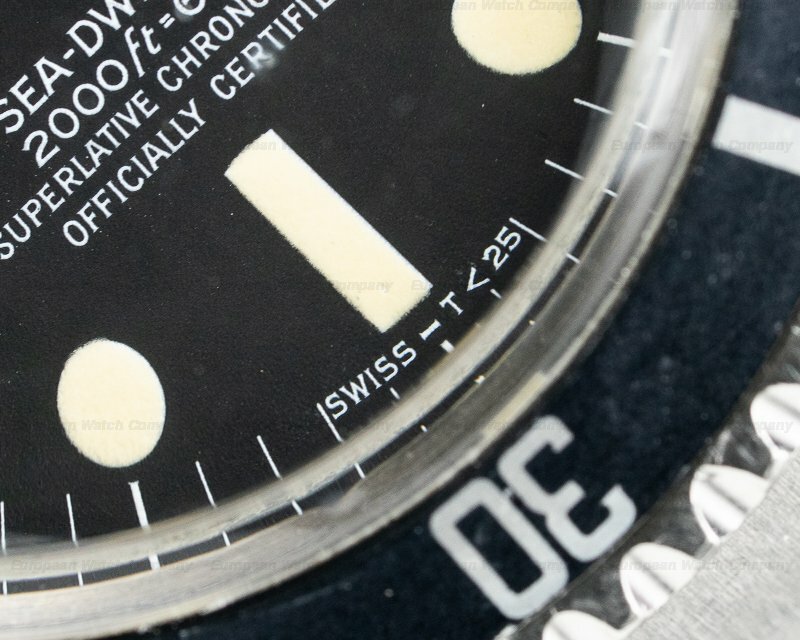 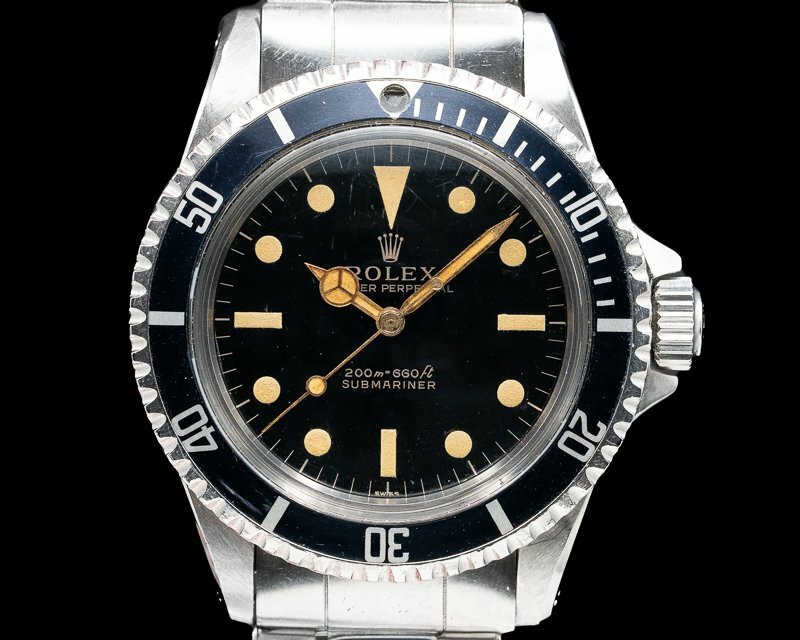 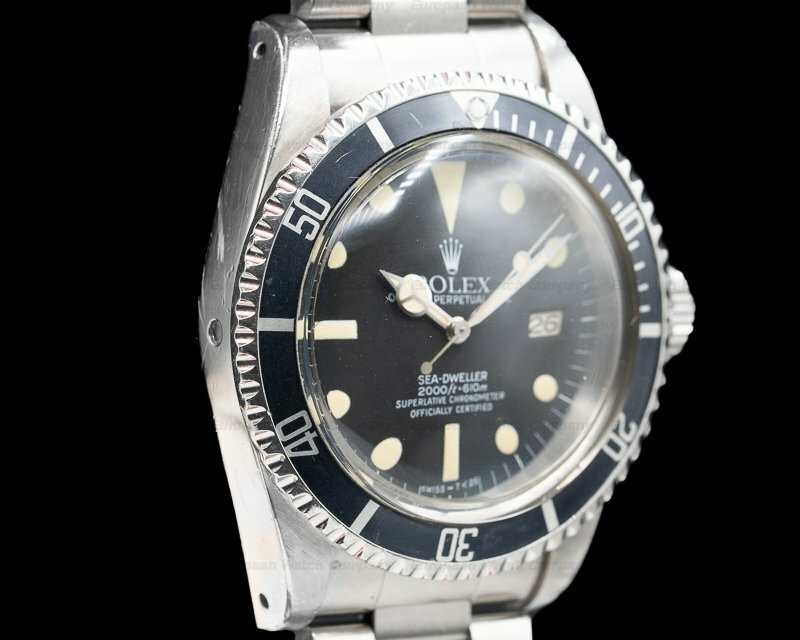 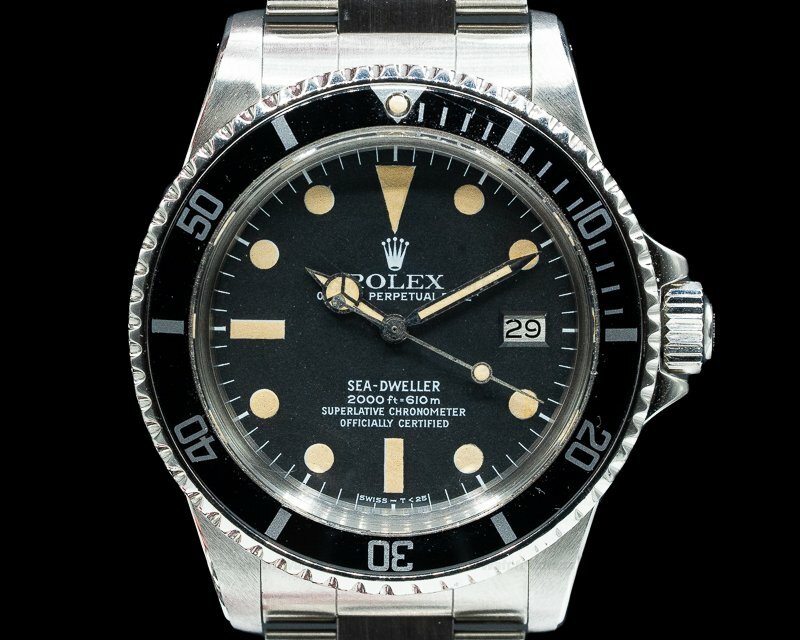 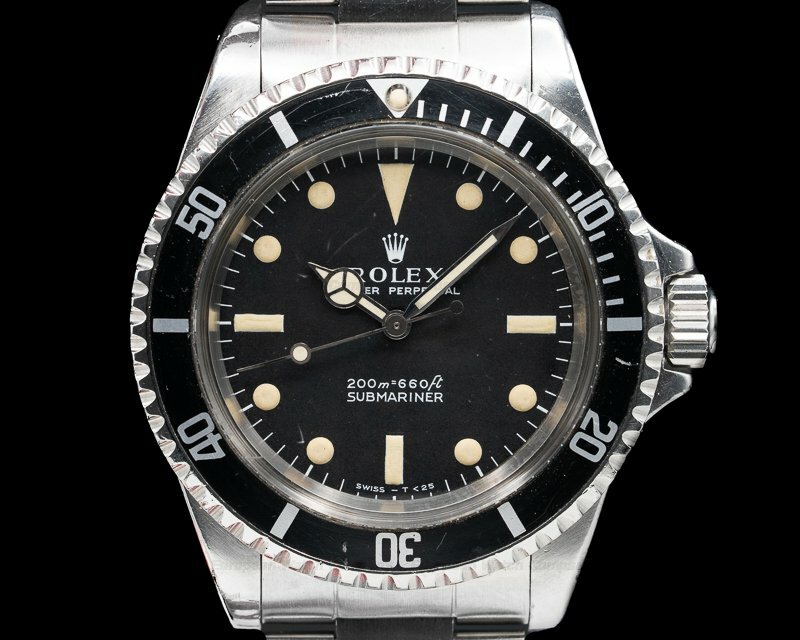 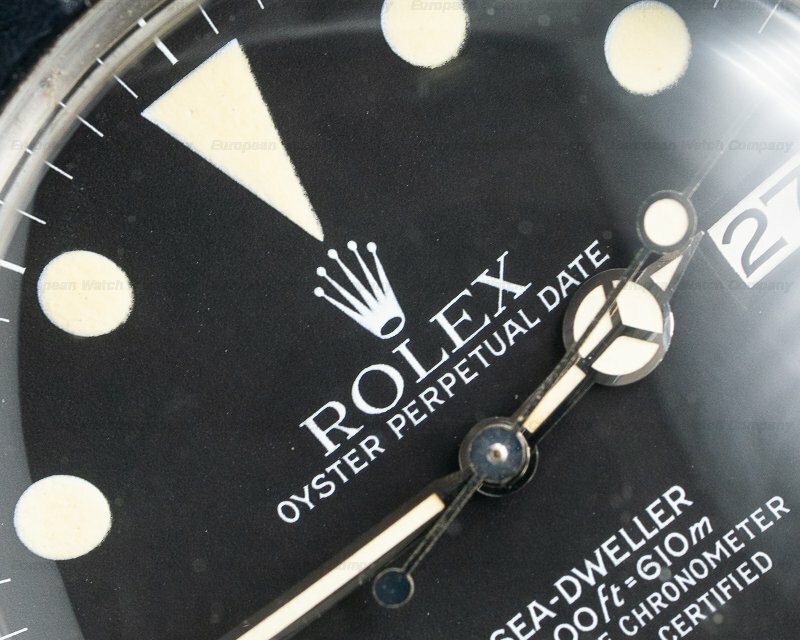 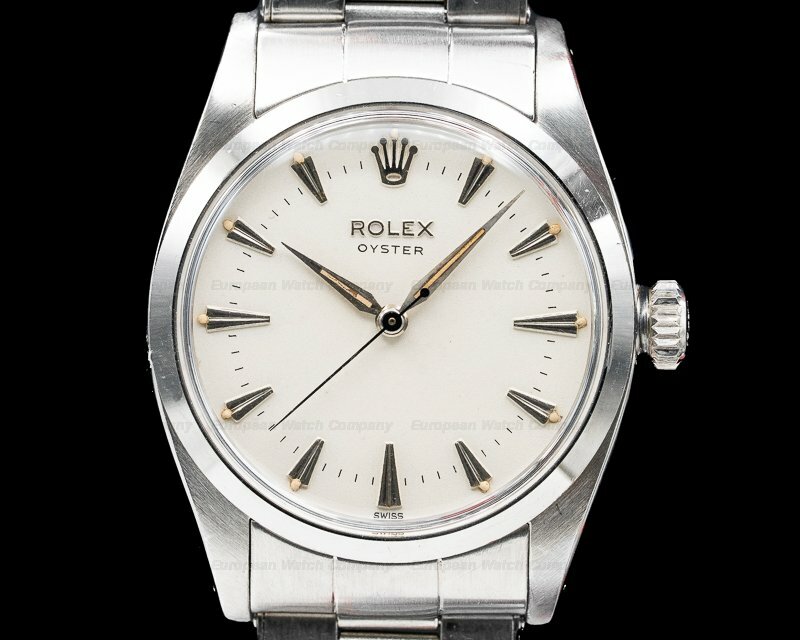 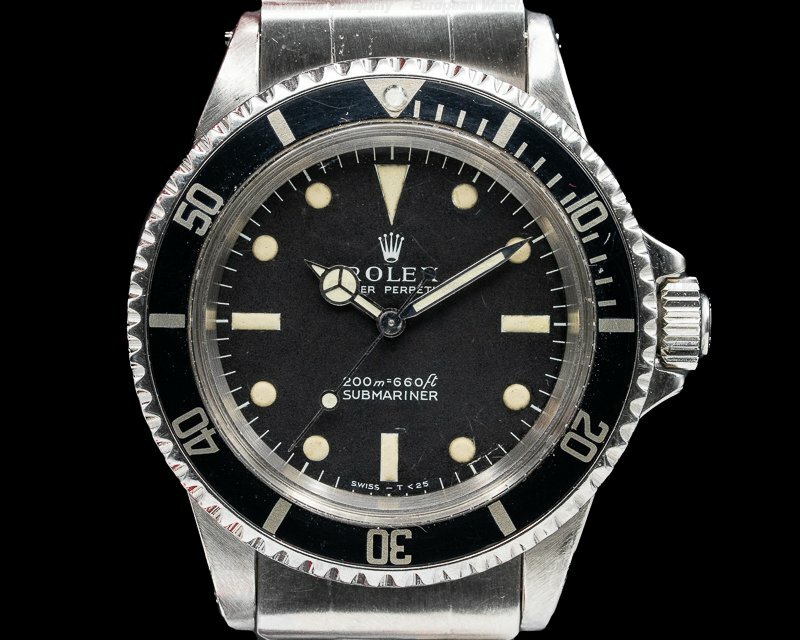 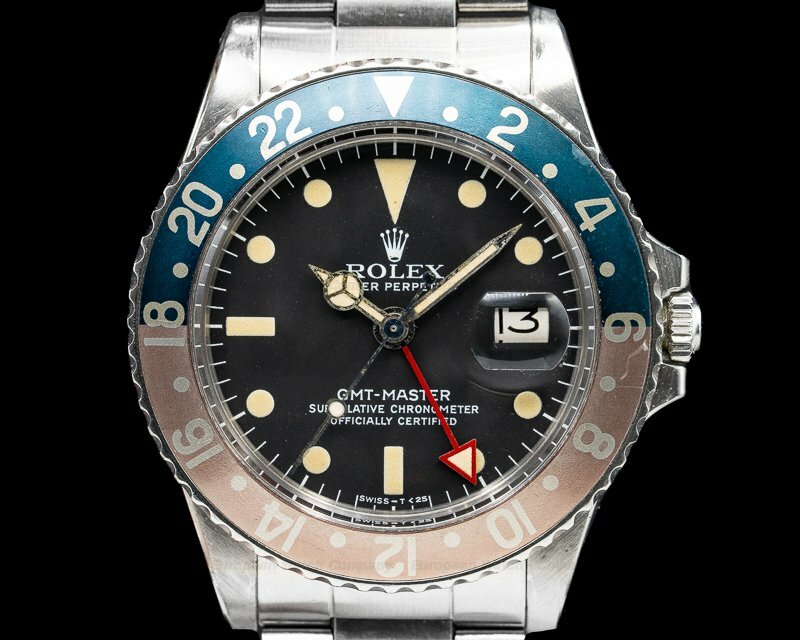 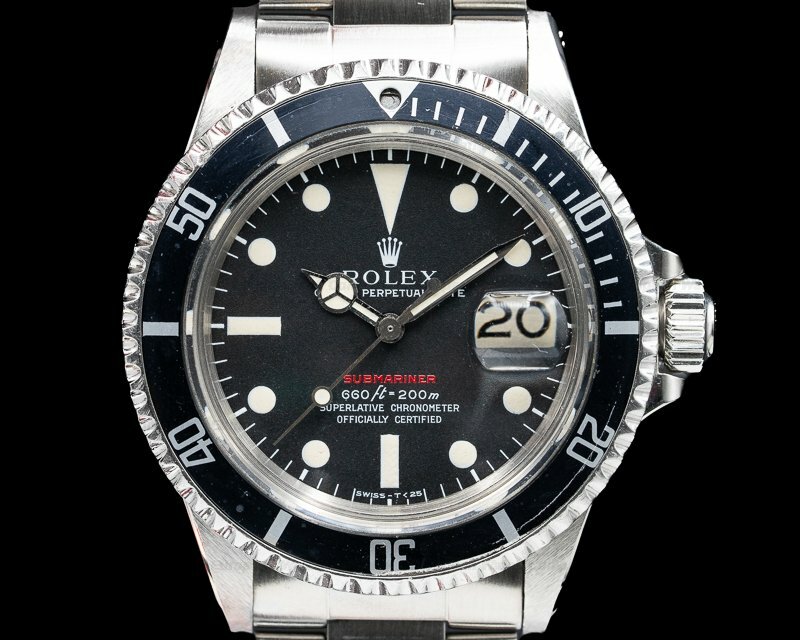 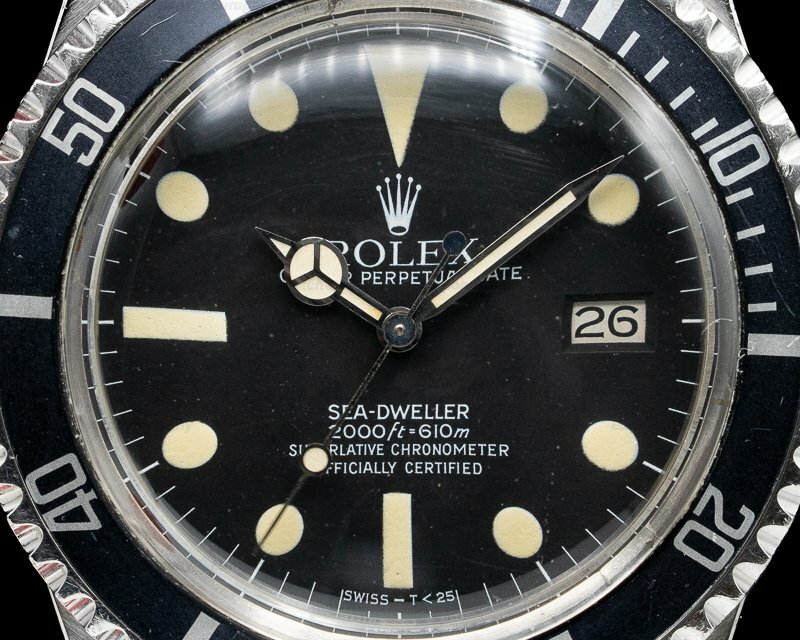 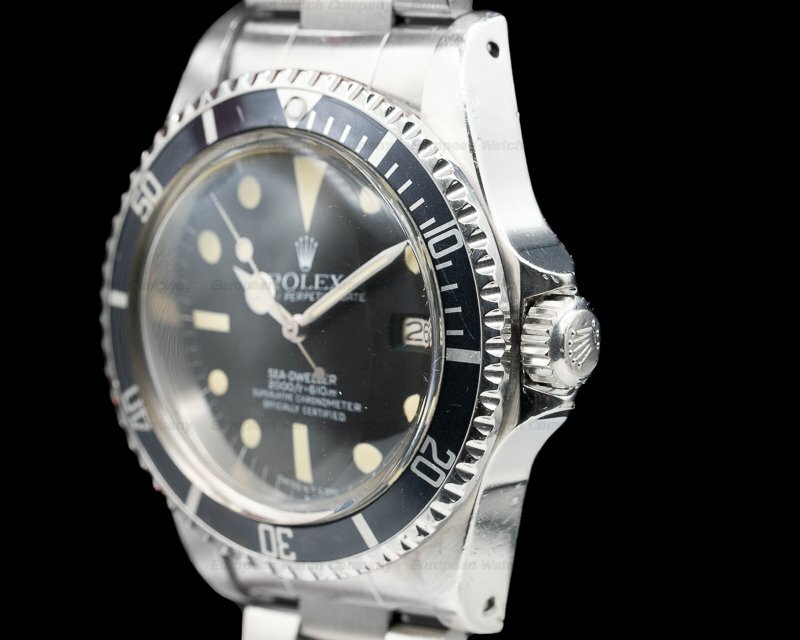 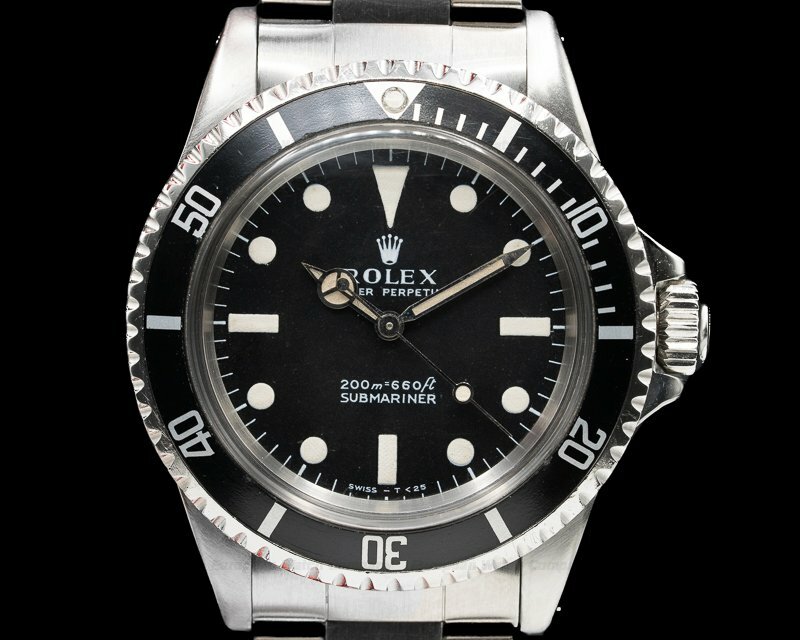 This is a 1983 stainless steel Rolex Sea Dweller 1665. 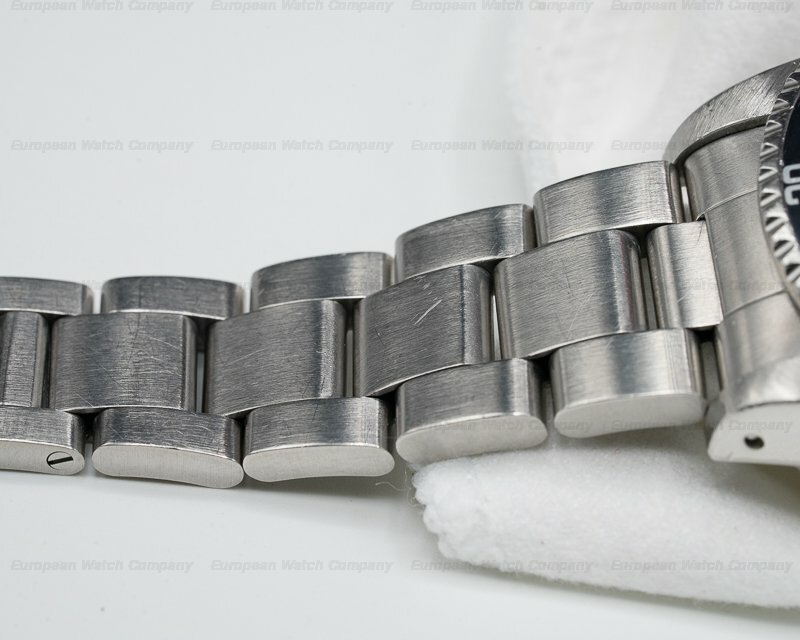 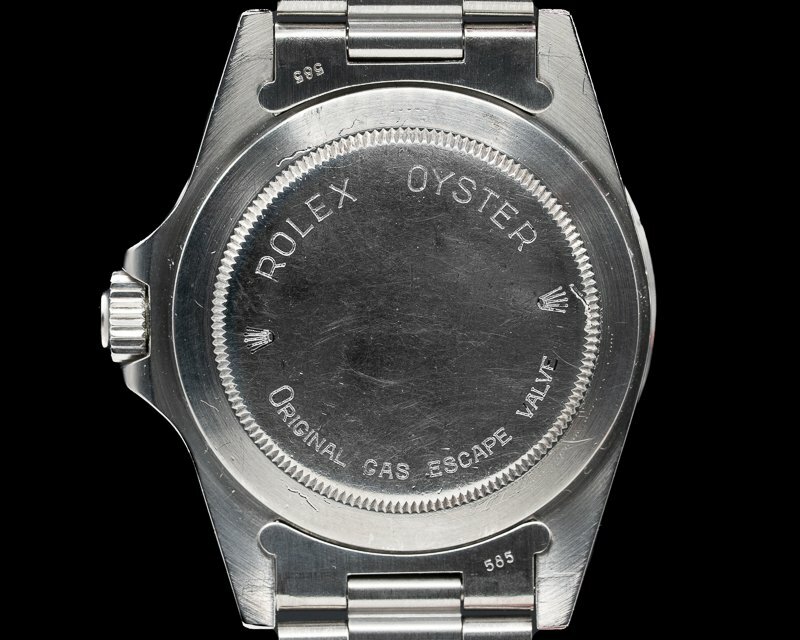 It has an integral stainless steel Oyster bracelet, and a scratch resistant domed sapphire crystal. 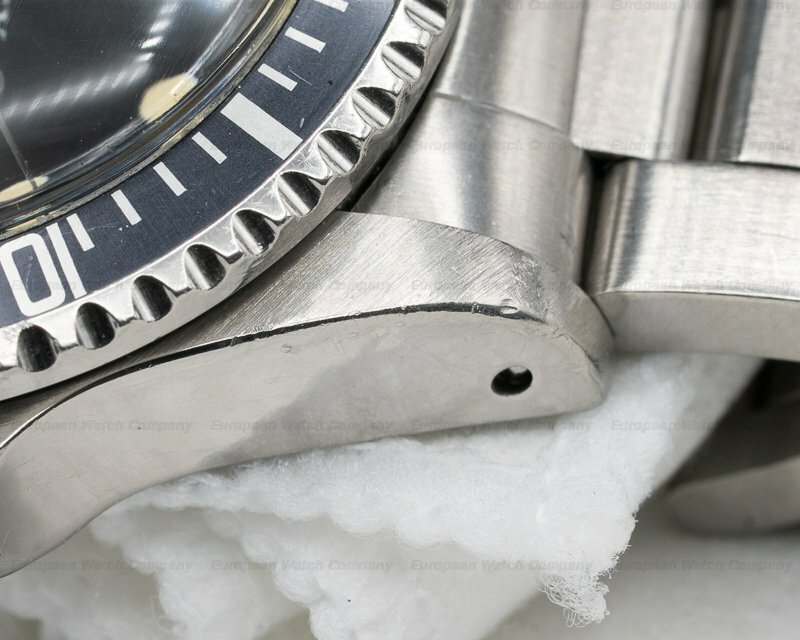 The 40mm diameter solid three-body case, screw-down back, bi-directional rotating bezel, and bracelet are polished/brushed. 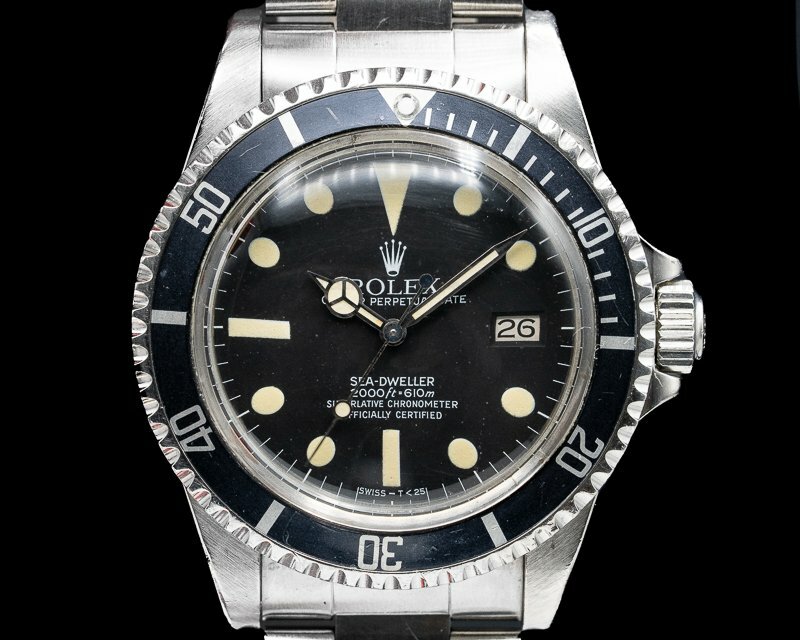 There is a helium escape valve in the case at 9 o'clock and the black bezel has graduated Arabic numerals for decompression times. 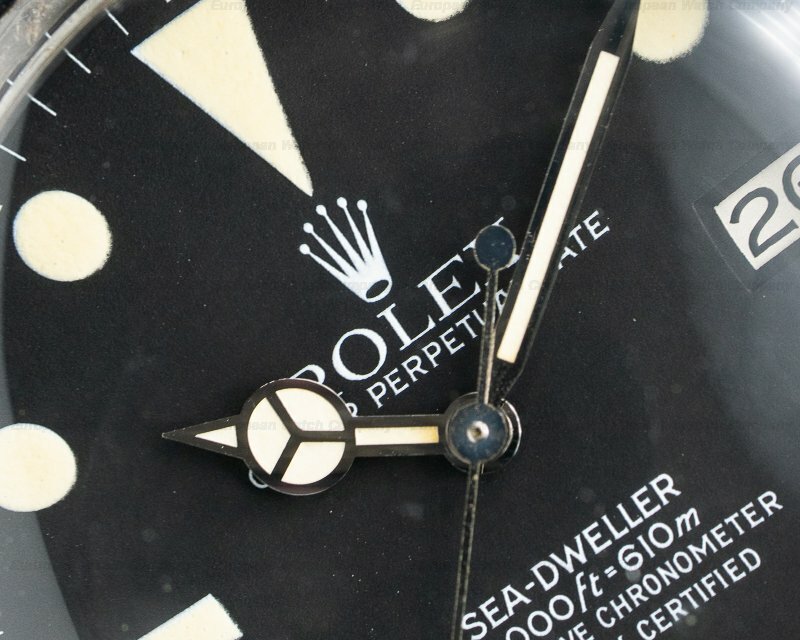 The screw-down Triplock winding crown is protected by a crown guard and the matte black rare rail dial has luminous Tritium coated round, triangular, and baton index hour markers, and luminous skeleton hands all with an aged cream patina. 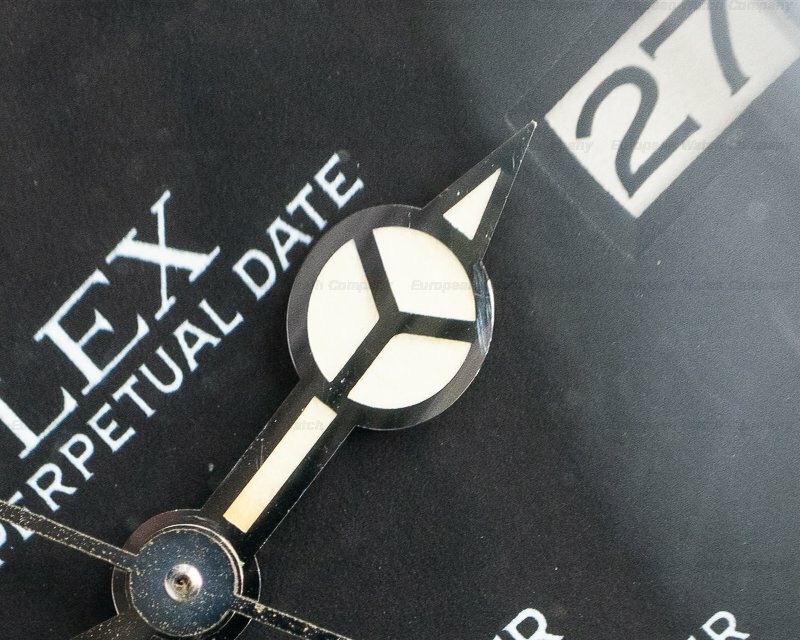 The date aperture is at the 3 o'clock position, and there is an outer minute/seconds track and a centered sweep seconds hand. 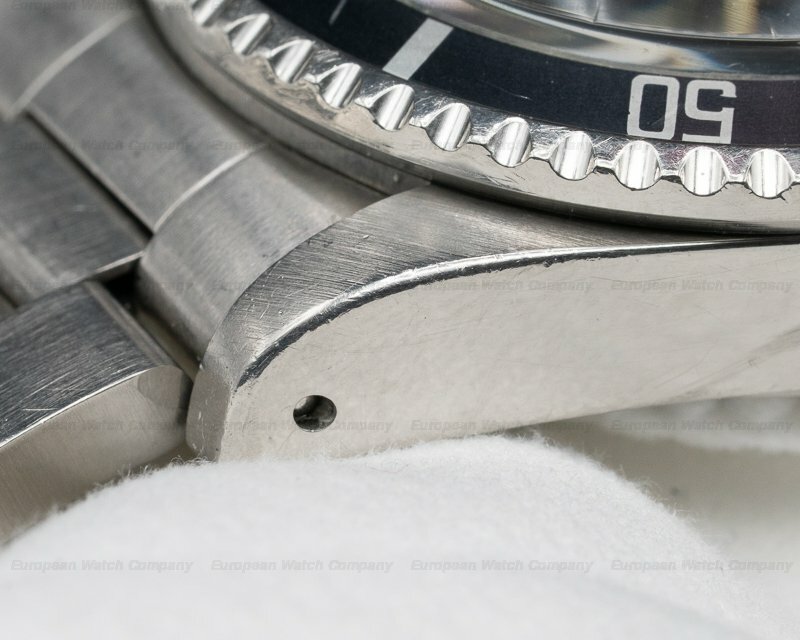 It's water resistant to 610 meters/2000 feet, and it's a Certified Official Swiss Chronometer (COSC). 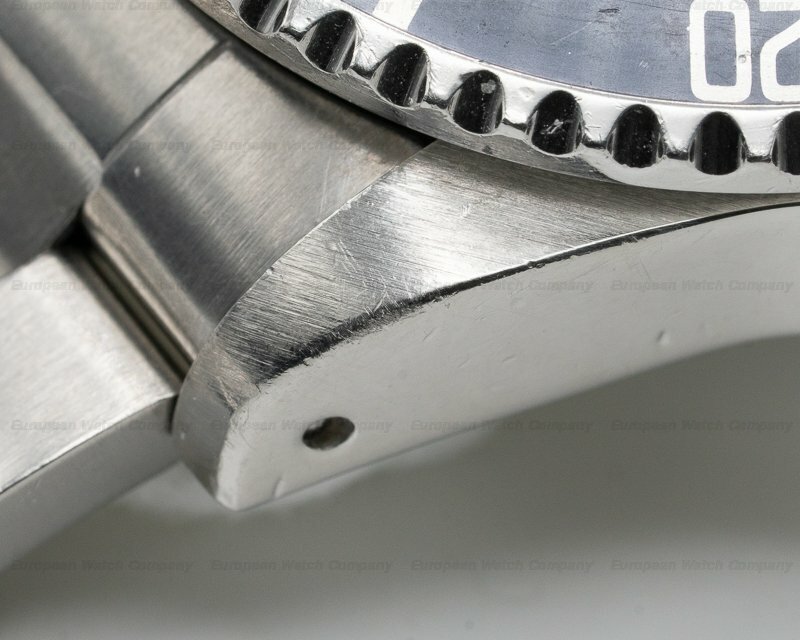 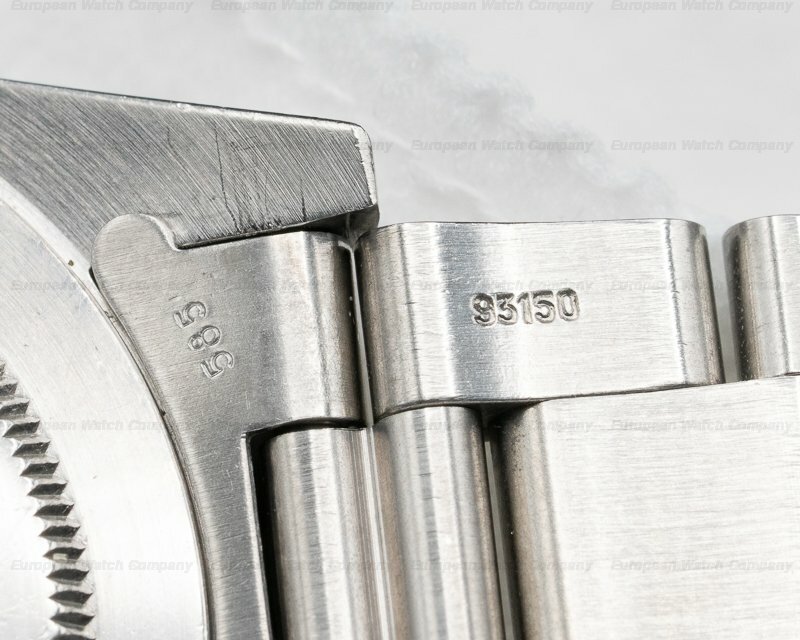 The 17mm thick case, dial, and movement are all signed. 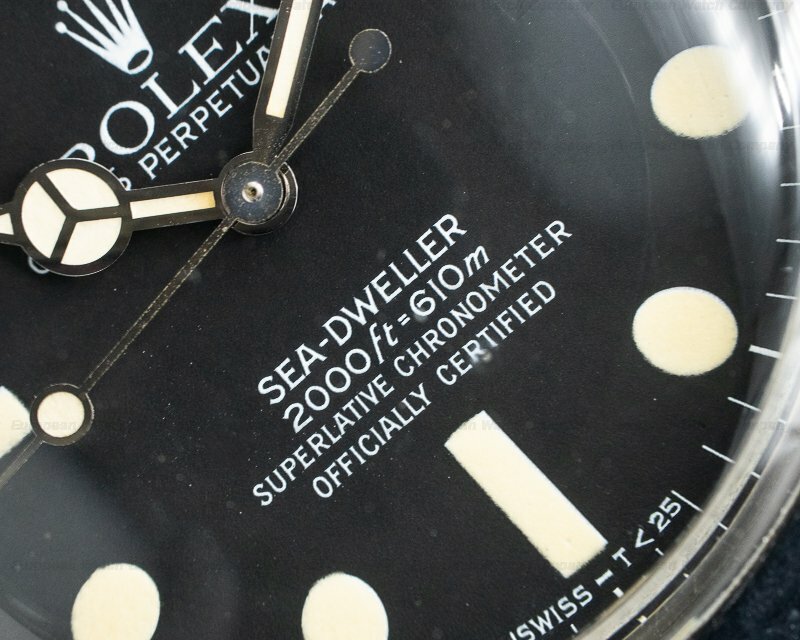 This Rolex Sea Dweller 1665 has a mechanical automatic self-winding Rolex caliber 1570 movement that's rhodium-plated, with oeil de perdrix embellishment. 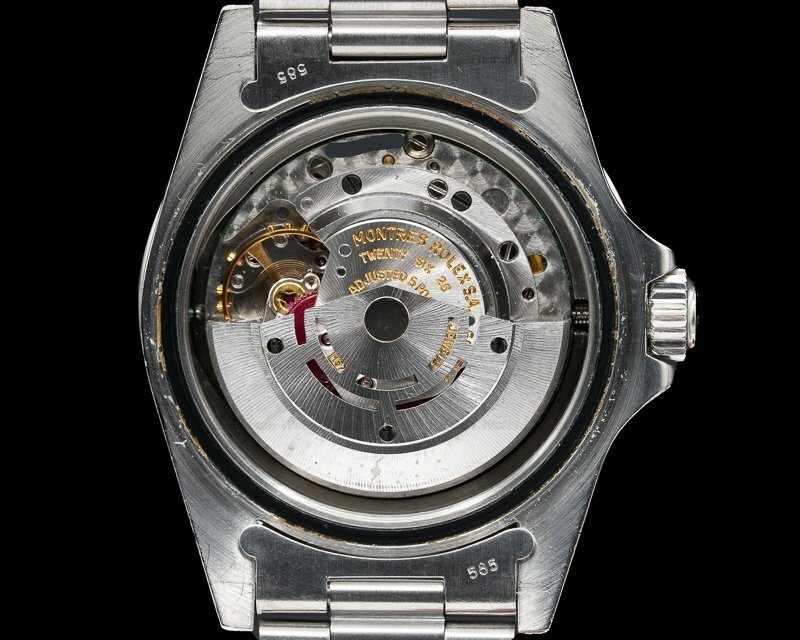 It's constructed with 26 jewels, a shock absorber mechanism, and a straight-line lever escapement. 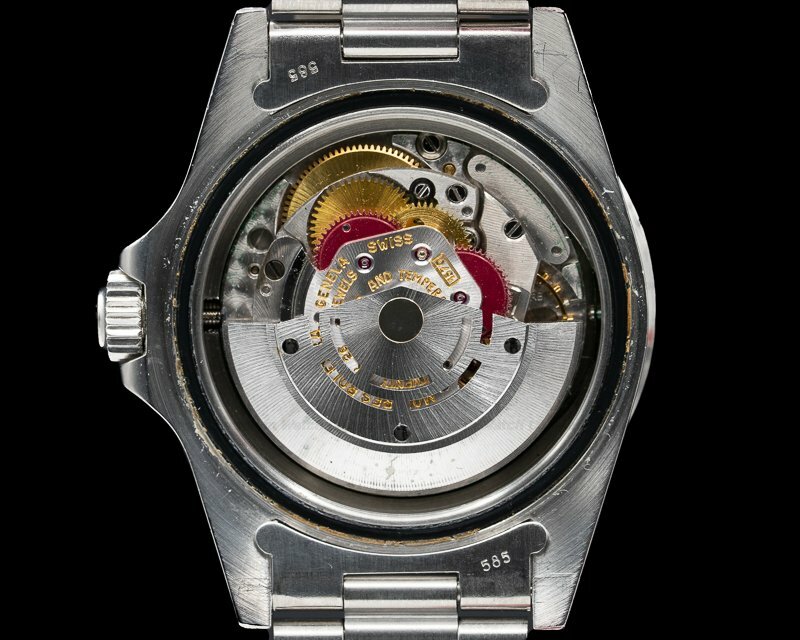 It includes a monometallic balance adjusted to temperatures and 5 positions, a self-compensating free-sprung Breguet balance spring, microstella regulating screws, and a hacking seconds mechanism.